... 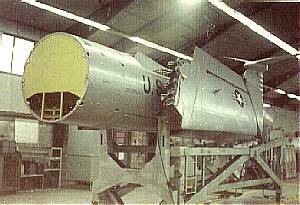 While I was in PATS (Personnel Awaiting Training Squadron) at Denver I had the dubious honor, at that time, of stripping the old paint off of this missile. It was in the process of being refurbished for the display condition you see in the picture. 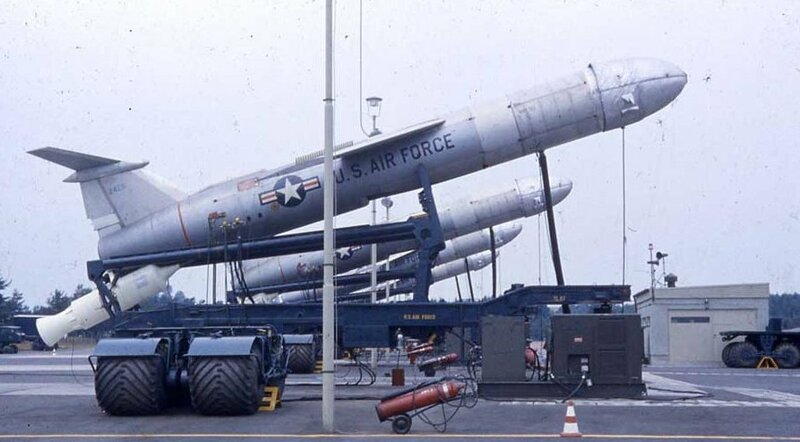 I worked in some bone yard near the flight line while stripping the paint off of the missile and stripping the skin off of my hands with the chemicals I used. I took this picture in May of 1961 a couple of months before I left Denver heading to Orlando. In 1998 I submitted this same picture to the Association Of The Air Force Missileers "Victors in the Cold War" book and it was published in B&W on page 48". ...For me it is fascinating to see what the picture really was in the 1950s and 1960s as opposed to what the official communication of the time wanted people to believe. 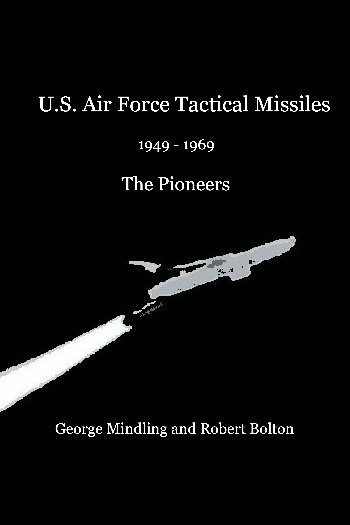 A fascinating book shedding some light on the early days of tactical nuclear missiles as well as the political background that even today is still largely hidden behind the propaganda of the time. Can´t wait to read the rest of it." Dieses Buch ist ein Muss für alle, die im Rahmen ihres Dienstes bei der U.S. Air Force mit den frühen Marschflugkörpern zu tun hatten, aber auch für deutsche Militärarchäologen, die in der Eifel, im Hunsrück oder im Pfälzer Wald schon über rätselhafte Hinterlassenschaften gestolpert sind. Nach mehr als 40 Jahren wird endlich eine Fülle von Fakten, Informationen und Geschichten zu den zwischen 1954 und 1969 in Deutschland stationierten, mit Automwaffen ausgerüsteten amerikanischen Matador und Mace auf den Tisch gelegt. Ausführlich und lebendig erzählen George Mindling und Bob Bolton von den jungen Missilemen, die im März 1954 erstmals in Bitburg ankamen - noch ganz grün im Gesicht, weil auf dem Atlantik schwerer Sturm geherrscht hatte. Von den T-33-Flugzeugen, die aus Übungsgründen so taten, als wären sie Matador-Flugkörper, über die Startstellungen hinweg in Richtung deutsch-deutsche Grenze donnerten und sich von der Gegenseite nur nicht erwischen lassen durften. 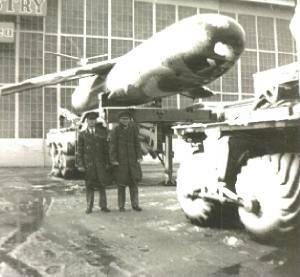 Oder von der Kuba-Krise, als die US Air Force Europe auf DEFCON 3 ging und an die Mechaniker in Bitburg Munition für ihre Karabiner ausgegeben wurde. A YB-61 being readied for launch. 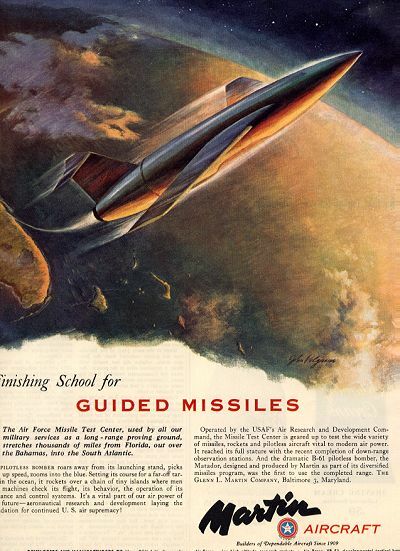 A YB-61 Prototype heads for the fringes of outer space in this artists conception of a guided missile's flight. 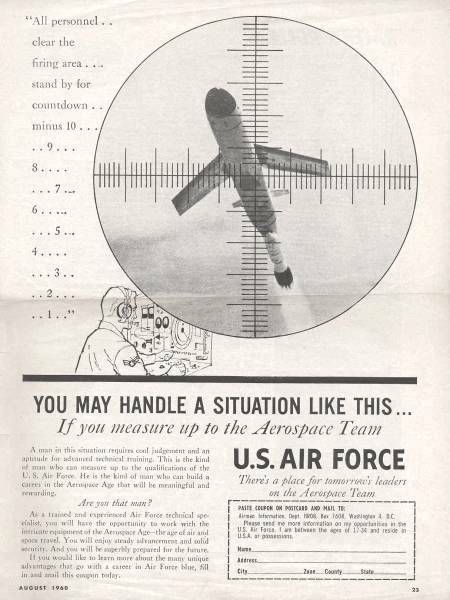 This full page Martin Aircraft ad commemorating the first ever use of the newly opened Atlantic Tracking Range by a Martin B-61 was one of two recently offered on E-bay. Span: 28 ft 7 in. Diameter: 4 ft 6 in. "I arrived at BAB about mid January 1956 and left about late November 1958. I was there when the missile burned in Tripoli. Some brave cowboy from armament roped the RATO bottle and dragged it off with a truck. When I first got to BAB the squadron was the 1st Pilotless Bomber (or Aircraft) Squadron. Malish flew back with our crew in 1958 and I was assigned to pet and comfort him all of the way home. I'm writing up all of my experiences at BAB. When I get through with it, I'll submit it to this web (TAC Missileer) page. It's good to know that you all are here". 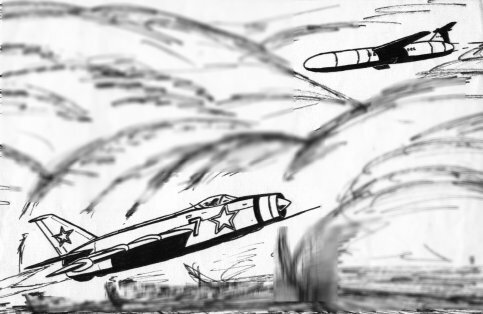 The TM-61A and TM-61C models had a sharp, pointed nose cone. The TM-61s were originally guided by SHANICLE systems, made by Reeves, and later by MSQ-1 radio command guidance units. 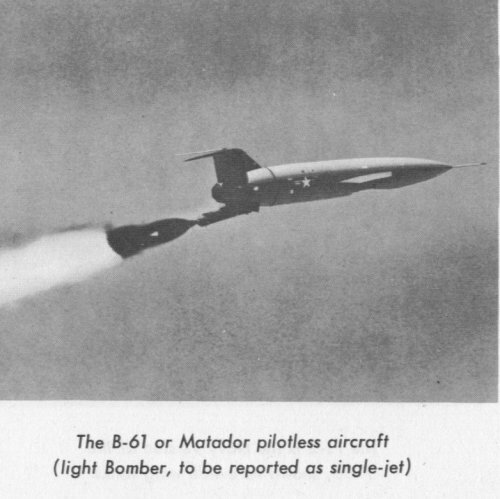 The original prototype Matador had a symmetrical tail pipe and aft fuselage section that apparently caused the missile to break up when it exceeded Mach .95 to Mach 1.15 during terminal dive. The Martin Company added an extension to the top of the fuselage called "the dog house" in a successful attempt to correct the problem. Early TM-61A's had the round aft section, but almost all TM-61Cs and the early TM-76As had the dog house, which actually added a flat, vertical panel directly above the tailpipe. The fuselage "doghouse" was dropped on later production TM-76A and all TM-76B missiles after the Martin Company added two hundred pounds of structural reinforcing to the wings and vertical fin. 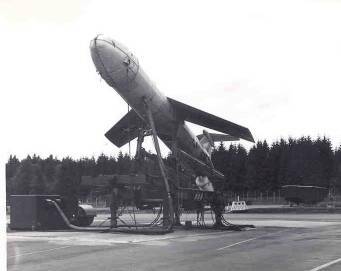 The fuselage tapered to the tail pipe equally all the way around on both later missiles. 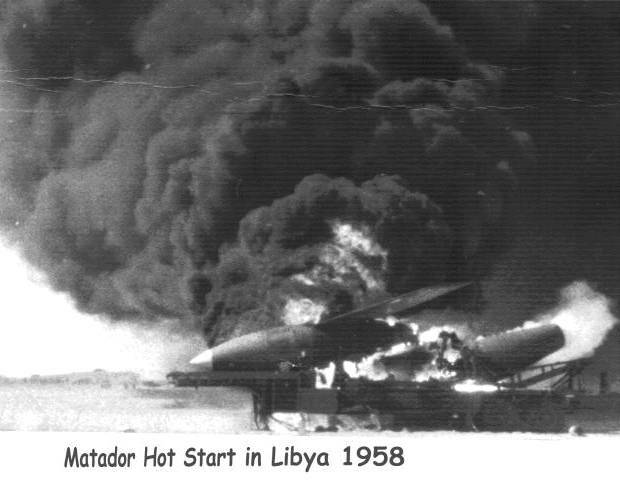 The Matador was sustain powered by The Allison J33-A37 engine while the J33-A41, was used to sustain power the Mace. Plastic Mace models of the era had the doghouse. 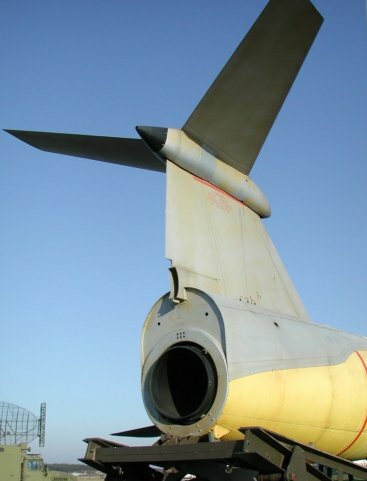 Richard Weigert (rweigert@PLASTEKGROUP.COM) commented on the doghouse being split in two halves vertically because of the vertical stabilizer mounting to the fuselage. "The "A" model we had in tech school did have a smoke making modification. This was simply a fourth nitrogen charged accumulator filled with jet fuel that was sprayed into the engine exhaust. The other three accumulators supplied fuel to the engine during terminal dive." 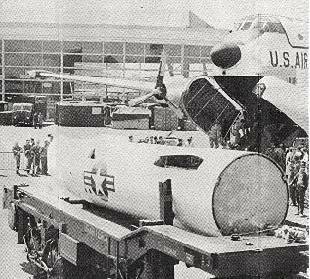 The Matador wing assembly had to be lifted off the airframe and trucked in a shipping brace alongside the fuselage or on a separate transporter. The special wing pivot and mounting assembly was designed for the Mace so the wings could be folded back and carried on the Translauncher ("A" Bird), or the launcher ("B" Bird) for quick assembly without the use of a crane. The TM-61B Matador was introduced in early 1957, but the number and name were changed later in the year to the TM-76 A Mace. 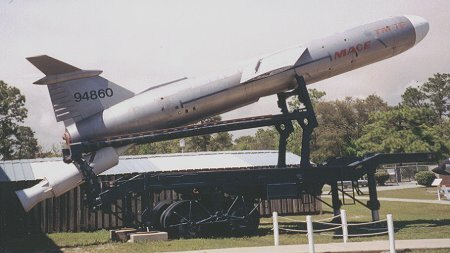 The development B-61B Matador had a curved radome nose, to accommodate the back to back mounted radar scanners, which moved the warhead to a new section of missile developed for the Mace. The Radar scanners dictated the use of the extreme nose as a mounting point, moving the warhead to a newly design and added fusleage piece that could be bolted right behind the new guidance package nose. The new warhead section bolted direcly onto the new fuel tank extension, which in turn bolted directly to the fuselage. A smart, economical way to build a reliable missile. This change, however, has caused identification and labeling problems even to this day. 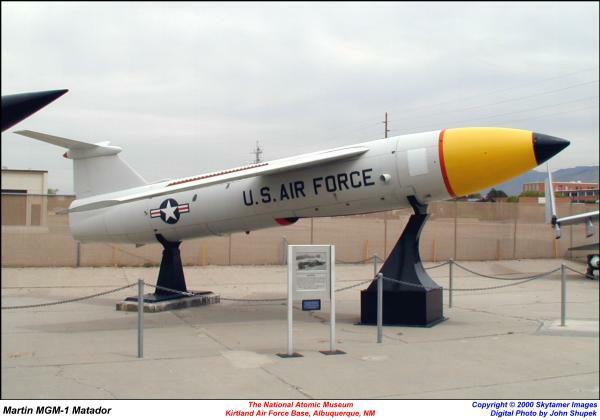 January 21st, 1957 - The debut of the US Air Force TM-61B Matador and the MM-1 Teracruzer occurred during President Eisenhower's 2nd Inaugural Parade in Washington D.C.
Confusion over the missile numbering and naming system has earmarked the Mace program from the beginning. The differences between the TM-61B and the other versions of the Matador, the "A" and the "C", and the deployment method differences between them required a new designation for the TM-61B. 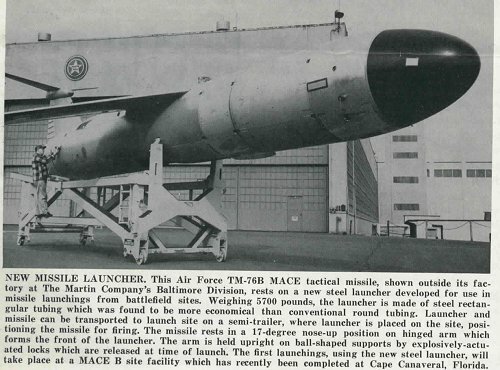 The TM-61B Matador was renumbered and renamed to the TM-76A Mace. The TM-76"A" designation was used to denote the ATRAN guided version of the Mace as opposed to the difference of a second, inertially guided hard site launch version TM-76"B", already under design. Below: The newly renumbered TM-76A on the Translauncher. While going through some of my family heirlooms, I found some old posters that my dad had received in the late 50's or early 60's when he was an engineer with Bendix. They show a Matador launching, a Mace in orange paint on a MM1 and a Vanguard launching. I found your site while looking for information about them. I don't know any details about them but I did want to share the images with you and other interested people. Keep up the good work and thank you for your service. Span: 22 ft. 11 in. Length: 44 ft. 6 in. PERFORMANCE: Maximum speed: 650 mph./565 knots in level flight; supersonic in final dive (Final ballistic dive was accomplished by severing the wings with primacord and locking the horizontal stabilizer) Range: 1,400 statute miles/1,217 nautical miles Operating altitude: From less than 1,000 ft. to 40,000 ft. The "B" version of the Mace was designed to be launched from complexes that consisted of 4 launch bays to a Launch Command Center. 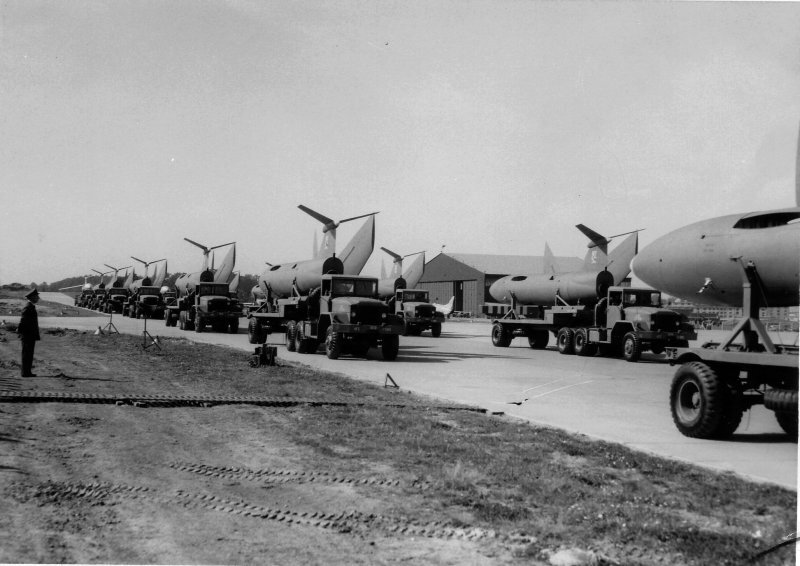 The Bitburg Launch complexes at Rittersdorf and Idenheim had two LCCs each, as did the four complexes at Kadena, Okinawa. 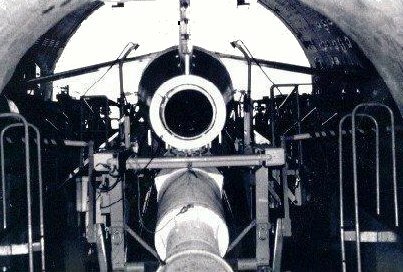 The operational "B" Birds were "cradled" in hardened launch sites that actually had "train track" type rails mounted at a 15 degree angle on a torsion bar suspended floor system in each launch bay. 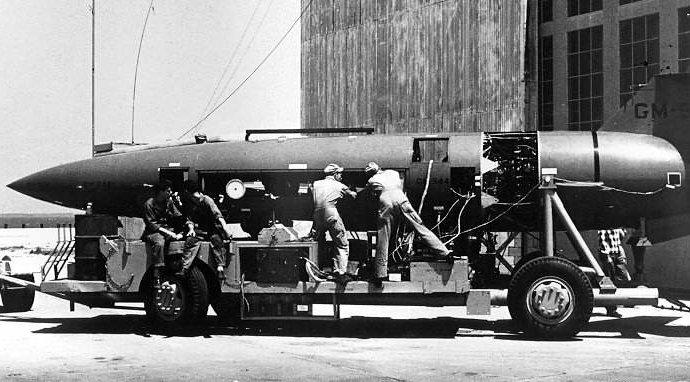 The missiles themselves were mounted on dolly style launchers with matching railroad type hard steel type wheels which allowed the launcher to be rolled into the launch bay from the lowered launch door. 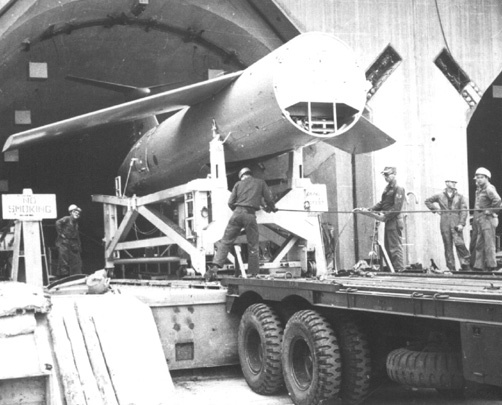 The missile was moved to the launch door from the transport truck bed which also had matching rails mounted on it. All the maintenance bays also had the rails mounted on the hangar floors. The missiles were lowered and raised from the launch and maintenance bays by cable and power winch. The launch bay had a huge torsion bar suspension system that "went soft" at the first sign of nuclear attack, allowing the birds to remain combat ready and immediately launchable. The dolly style launcher sat on the suspended cage, and actually dismantled on missile firing, with the missile actually flying through the collapsing launcher after the Thiokol RATO bottle was fired. Having explosive bolts (E-81's or 83's) in strategic locations that fired along with ignition of the RATO bottle accomplished the task of collapsing the launcher. The "B" Birds had an Inertial Guidance System from AC Spark Plug. The stabilized platform (the guidance system) or as it was simply called the "gimbal" carried 5 gyros total: two were gyros and three rate accelerometers which had to be aligned with a theodolite that was on a surveyors mark to reference it for launch. The same theodolites were used in the maintenance areas for Guidance System Checkout. The inertial guidance system dictated the use of the fixed hard sites for launch as it would have been impossible to reference the Gyro Stabilized Platform outdoors without surveying the launch location and the location of the referencing theodolite beforehand. The hardsite concept removed alignment process fom taking place outside in inclement weather or at night. "B" bird launches from TM-76A translaunchers at the Cape were done under controlled conditions using scaffolding that was not part of the operational concept. The nose cone was aluminum and was the same color as the fuselage. The intricate web of wiring that surrounded the inside of the nose cone were piezio-electric contact fuses. The missile in the clipping mounted on the "B" style launcher is actually an "A" model with the fibreglass nose cone on a "B" Bird hard site launcher. The missiles were otherwise almost identical. The "B" bird flight controls did not use a Directional Gyro as the "A" bird, using the Inertial Guidance system to fulfill that function instead, but both models used the Vertical Gyro. 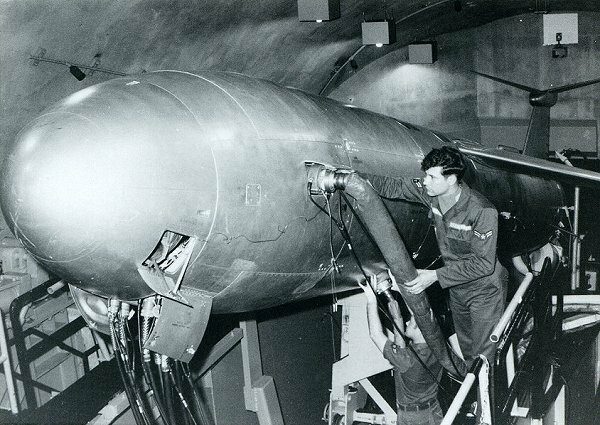 An operational CGM-13B of the 498th Tactical Missile Group is prepared for launch countdown at Kadena Air Base, Okinawa, in 1969. The nose cone is painted white instead of the natural aluminum of the operational "B" missiles and it is display mounted on an "A" Bird Translauncher, used to launch the first "B" birds at Cape Canaveral from open hard Pad 22 before the fixed hard sites 21-1 and 21-2 were completed. Renaud Mangallon (renax@club-internet.fr) sent this photo and page for the TM-76B modeled directly after the TM-76B (CGM-13B) on display at the USAF Armament Museum at Eglin Air Force Base in Florida. Even the decal for the tail number (94860) is a perfect match. A CGM-13B Mace-B on display at the American Legion Post 18 in Wildwood, Florida, April, 2005. The Mace was assigned to the 4504th Missile Traing Wing, Orlando Air Force Base, until deactivated in 1966. The "Wildwood" Mace was relocated to the Indiana Military Museum in Vincennes, Indiana, in April, 2010, in a project spearheaded by the TAC Missileers Association. TAC Missileers Association. Click on the video labeled "Mace Move Day"
The Mace display at the Indiana Military Museum in Vincennes, Indiana, is scheduled to open sometime in the near future. The Tactical Missile designation was changed to MGM-13A and CGM-13B to help non-military personnel (such as members of Congress and the pentagon) identify the type and purpose of U.S. weapons systems. The poorly explained logic at the time even confused the Air Force, which incorrectly relabeled the "A" Birds as MGM-13B for a short time, and B birds as MGM-13C units, (see the numbering on the adjacent Launch Order TO). In the first attempt at correcting the error, the "B" Birds were relabled as CGM-13C before finally being labeled as the CGM-13B. 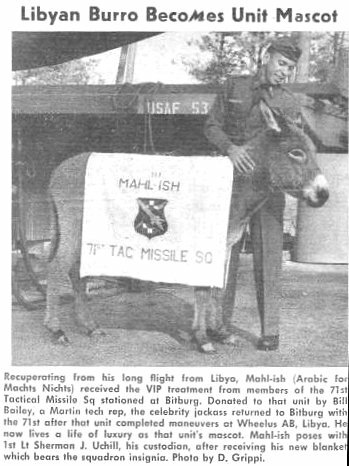 The "B" missiles at Bitburg were correctly renumbered when it was found the MGM designation meant "mobile", which the "B" Bird clearly was not. MGM meant "(M)Mobile (G)Surface Attack (M)Missile"
CGM meant "(C)Coffin (G)Surface Attack (M)Missile". Using the pub tables provided for these categories in the case of the MGM the decoding would read (M)Mobile;(G)Surface Attack;(M)Missile while the CGM would decode as (C)Coffin;(G)Surface Attack;(M)Missile. Thanks to Bob Bolton (olliesnapper@gmail.com) for providing the information from the invaluable DOD manuals and the Block House Operating Technical Order (TO), the bible for the "A" Bird RFML launch crews. "How do you steer that thing?"